This program can be used to track all statistics available to you while playing Overwatch. By tracking the changes to compositions and your SR ratings, you can keep track of your progression, best teamcompositions and so on. 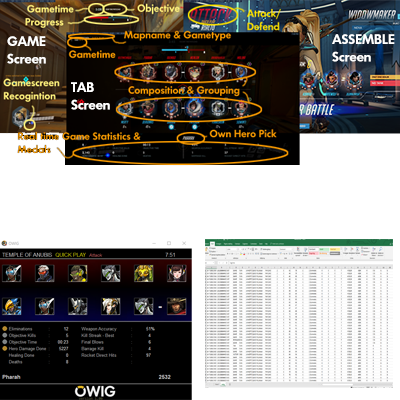 OverWatch Information Gatherer, OWIG for short, uses two modes of operation: Or you use screengrabs (.png format, do not use loseless formats) or will run alongside your play and captures the screen on configurable frequency. After reading the screen image, it will try to decipher what information is available on your screen and shows it in its own gui and writes it to a log file in excel of "plain" .csv format. Download & unzip the the OWIG.zip file to any directory and you can run owig.exe from there. Edit the owig.ini file to your likings, like where to store csv of xlxs file or pause between taking screenshots. You can track multiple accounts by using multiple ini files for each. Just make sure it is provided as first argument after calling owig.exe. Don't make use of the option of some programs to display overlays - like discord -. These overlays might "hide" information that is needed for intepretation of the screen.